"Is the universe holographic? Probably. Get microscopic enough and you start seeing pixels. Stephen Hawking has revealed from beyond the grave his final scientific theory; that the universe is a hologram. The cosmologist, who died in 2018, has challenged previous theories of cosmic "inflation" and the "multiverse" in his last paper published in the Journal Of High Energy Physics. Scientists generally believe that for a tiny fraction of a second after the Big Bang, the universe expanded rapidly before settling into its present state, filled with stars and galaxies, as defined by the inflation theory. But some have proposed that, on a grander scale, inflation goes on for ever, giving rise to a "multiverse, an almost infinite number of different universes with their own laws of physics. Applied to inflation, the newly published theory suggests that time and "the beginning" of the universe arose holographically from an unknowable state outside of the Big Bang and there may be a much smaller number of multiverses than originally thought. "I learned a long time ago that reality was much weirder than anyone's imagination." 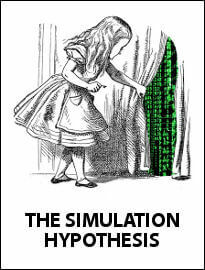 ﻿A version of the simulation hypothesis was first theorized as a part of a philosophical argument by René Descartes. The philosopher Nick Bostrom developed an expanded argument examining the probability of our reality being a simulation. 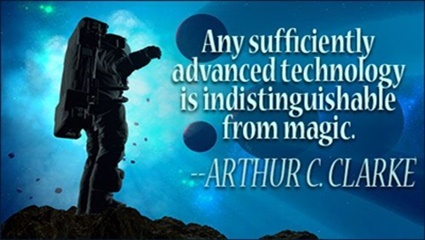 His argument states that given sufficiently advanced technology, it is possible to represent a simulated consciousness comparable or equivalent to a naturally occurring human consciousness, and that one or more levels of simulation within simulations would be feasible given only a modest expenditure of computational resources. In short, given sufficiently advanced technology, through a computer generated simulation, it would be possible to create ﻿an imaginary person, living in an imaginary world, whose imaginary consciousness was totally unaware that he, the world and his awareness of his place in the world, were only part of a magical illusion. Today, many of us already have a magician’s box of tricks in our homes, capable of producing at least a partial facsimile of the virtual reality magical illusion, within which we act out our violent fantasies via World of Warcraft or Grand Theft Auto . For the moment, video game characters don't really exist, they are only an illusion, created by a program devised for our personal amusement. Or, when the games are played on-line, for the amusement of the proletariate in a virtual Roman Coliseum. But, before long they may be sentient and that may be something that alters our perception of what life means. Brian Tomasik is a consultant at the Foundational Research Institute, which explores possible avenues for reducing suffering in humans and other sentient beings, now and in the future. Recently, he has become interested in the question of what moral consideration, if any, we should give to characters in video games. He argues that, while these simulated characters are not at present, sentient beings, the difference is one of degree rather than kind, and we should care at least a tiny amount about their suffering, especially as they grow more complex. This is somewhat reminiscent of a moral dilemma Mark Twain touched upon in his unfinished manuscript “The Mysterious Stranger”. In one story, a handsome teenager comes into town and he claims to be an angel; not only that, but he claims to be the nephew of the fallen angel whose name sparks fear in humanity, Satan. To prove his claim, he performs several magical feats. In one, he has the children create small people from clay, which he brings to life. As the tiny people interact with each other, they begin to show signs of cruelty and violence and he then. When their noise irritates him, he squashes them and destroys their village with an earthquake.﻿ The children are horrified, but when chastised for this seeming cruelty Satan’s nephew responds that he has done nothing that God has not done many times before, as witnessed in the Bible and whether the people killed are real or only simulations is of no consequence﻿ as life is all an illusion anyway. As our SIM discussion relates to Twain's story, whether it matters philosophically﻿ if the people killed are real people or only simulated people in a virtual reality game is a moral and an ethical question that each individual gamer must come to grips with themselves. Perhaps, as these characters are now still just "illusions" the need for that introspection is premature, you can continue to press the kill button in the game without seriously darkening your soul. But, when and if the characters in the game become sentient and can experience the fear and pain of being killed are you then committing murder? You will have to ask yourself when that time comes, if you will stop pressing the kill button, or will you take the game to a new darker ethical level? Perhaps the future of civilation will hang on the answer to that question. For, what if those game pieces realize who is killing them and decide to do something about it. "The list of things which we absolutely know, is not a long one, and we have not the luck to add a fresh one to it often, but I recognized that I had added one to mine this day. I knew, now, that it isn't safe to sit in judgment upon another person's illusion when you are not on the inside. While you are thinking it is a dream, he may be knowing it is a planet"
At a recent Isaac Asimov Memorial Debate, scientists gathered to address the question "Is the universe a computer simulation?" 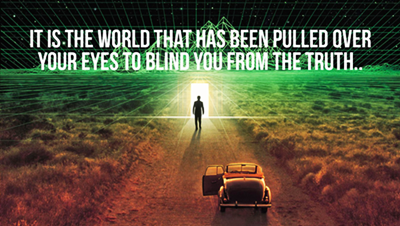 It is one of the oldest questions imaginable: "How do we know that reality is reality?" At the debate, host and celebrity astronomer Neil deGrasse Tyson argued that the probability is that we do live in a computer simulation. The crux of Tyson’s point is, could it be possible for mankind to simulate a universe, at some point in the future and if so, can we then assume that some species, somewhere, will simulate or has simulated the universe at some point Then what is the possibility, or even the probability that we live inside such a simulated universe. And, on a truly infinite timeline, we might expect an almost infinite number of simulations to arise from an almost infinite number or civilizations and if the simulated inhabitants of these simulated universes themselves can run universal simulations then the prospect there may be anything as definable as “reality” is impossible. Dr. Rich Terrile, a scientist at Nasa’s Jet Propulsion Laboratory, says the reasons to believe that the universe is a simulation include the fact that it behaves mathematically and is broken up into pieces (subatomic particles) like a pixelated video game. “Even things that we think of as continuous – time, energy, space, volume – all have a finite limit to their size. If that’s the case, then our universe is both computable and finite. These properties allow the universe to be simulated,” he adds. Terrile believes that recognizing that we are probably living in a simulation is as game-changing as Copernicus realizing that the Earth was not the center of the universe. “It was such a profound idea that it wasn’t even thought of as an assumption,” he said. Or until the moment comes ﻿when someone reboots the game and it starts all over again.